Sweet lassi- A refreshing and cooling drink to beat this hot summer. In May, the temperature of Chennai is at its peak and these hot summer days are called Agni nakhathram or Kathiri veyil. People are afraid of going out and trying to avoid outside journey, especially in two wheeler or by walk. Schools and colleges will remain closed these days. I usually visit my native place during these hot sunny days. But this time, in Kerala also, unlike previous years, met reports indicating a hot climate. I generally will change my food habit during this period to maintain my self cool and fresh. We will include more watery fruits and vegetables like watermelon, cucumber etc and strictly avoid non-veg and spicy food. It is necessary to highlight the importance of drinking plenty of water during this period. 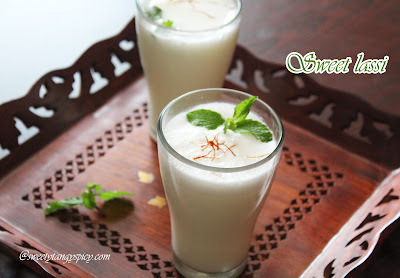 If it is difficult to drink plain water, then include juices, buttermilk, shakes etc in your menu. 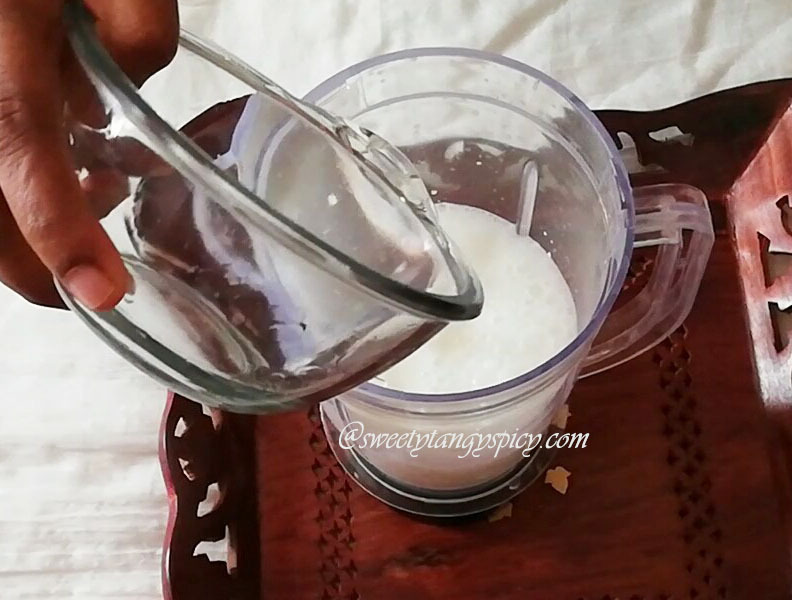 Buttermilk is an excellent option to keep our body cool. 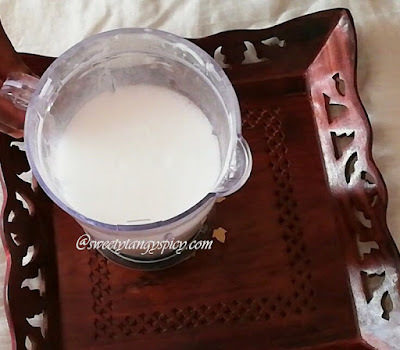 We know the importance of smabharam (spiced butter milk) in our forefather's period. It really cools and refreshes our body, yes, that change is very instant. Today, my post is one such recipe with buttermilk, The sweet- 'sweet lassi'. It is actually a North Indian drink, but nowadays it is available in south India too. 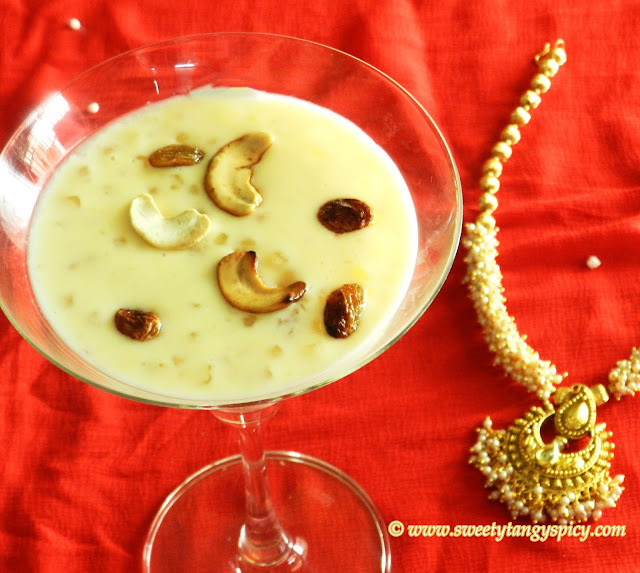 Once we tasted it and fell in love with it and tried in home and got the exact taste. 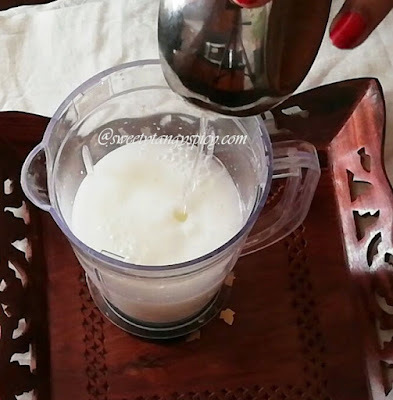 Since last few years, I am making this at home regularly, especially from march to may months. It is simply the sweetened butter milk with rose flavor. You can also use other flavors like cardamom or saffron instead of rose flavor. 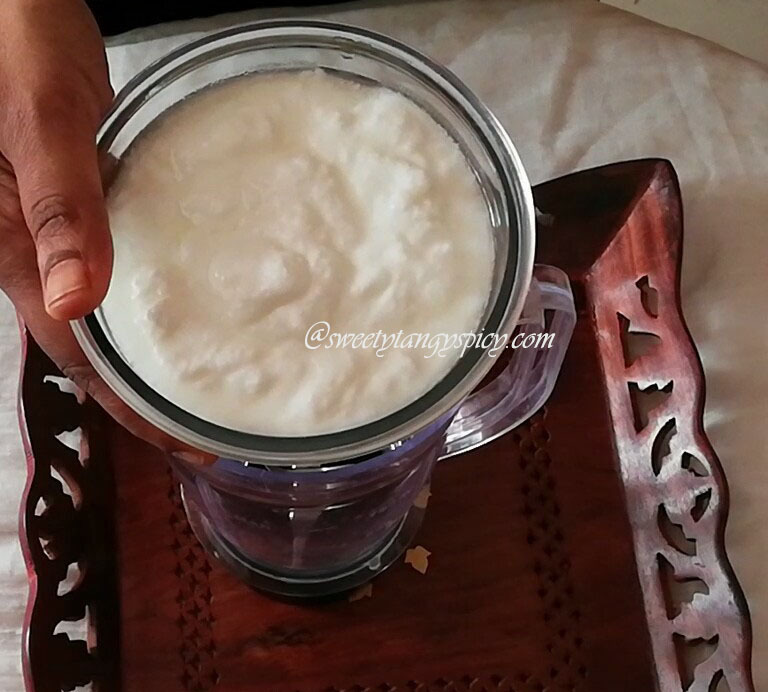 In a mixer juice jar, take 1 cup of fresh thick yogurt. Then pour one cup of water (or milk). 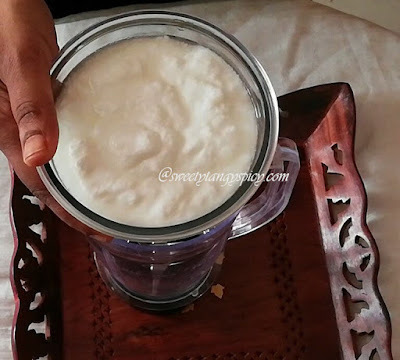 Curd has its own cooling effect, so I don't think it is necessary to add chilled water or milk. I usually use normal water or milk, also I personally don't recommend the use of ice cubes. This recipe yields moderately thick lassi, If you like to have thin lassi, then you can add 1.5 to 2 cups of water. Add sugar to your taste. I added five tablespoons of sugar. 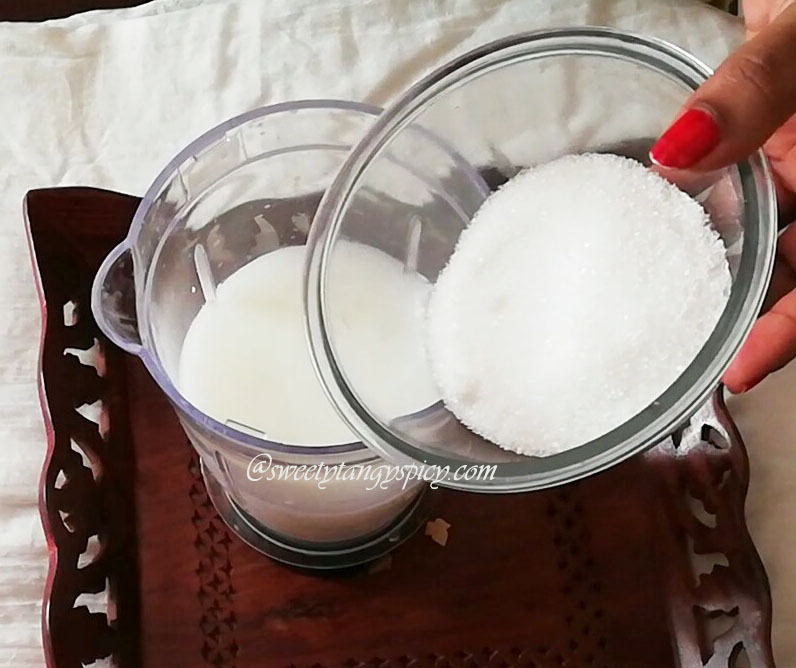 Usage of sugar depends on the taste of buttermilk, if it's too sour yogurt needs more sugar and vice versa. Finally, mix two and half tablespoons of rose water. Otherwise, you can add a small teaspoon of cardamom powder and a few strands of saffron. It is an optional step, without flavoring agent, you can enjoy it. Cover the jar and blend till the sugar dissolve. You will see a nice froth on top. Transfer to glasses and enjoy. 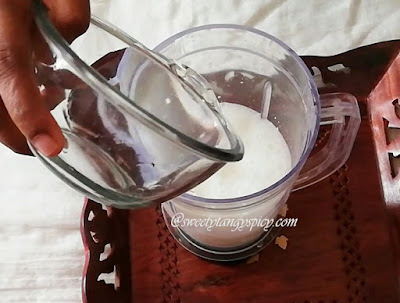 The method described here is the easiest one, but still you can use normal churner instead of mixer jar. If so, make the yogurt smooth before adding water and other ingredients. Otherwise, it will be difficult to get rid of lumps.